This ‘Personal Histories of CAA’ film tells the story of CAA throughout the years as experienced by previous chairs and key participants. CAA grew out of a small group of archaeologists and mathematicians interested in computer applications working in the UK in the early 1970s. The first conference was organized in Birmingham in 1973. It gradually evolved into an international event, and in 1992 it was organized outside the UK for the first time. Since then, CAA conferences have taken place in a different country each year. Since 2006 conferences are held outside Europe as well. celebrated this event with the Personal Histories of CAA session held at the CAA conference venue on Wednesday 28 March, from 2pm to 4pm. At this celebratory session the founders, former chairs and key members of CAA throughout the last four decades shared their personal experiences with us. We were honoured that for this event we were able to welcome to Southampton Sue Laflin, Phil Barker, Clive Orton, John Wilcock, Nick Ryan, Paul Reilly and Hans Kamermans, as well as listen to an interview with Irwin Scollar. The session was moderated by the current chair of CAA, Gary Lock. 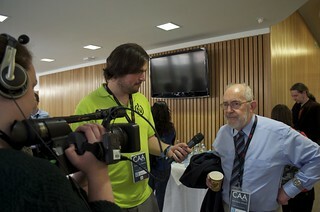 The contributors discussed the advances in the field of archaeological computing fostered by the CAA as well as many personal social experiences. the current generation of archaeologists aware of such dramatic shifts, and to provide personal perspectives for charting fascinating future research avenues. For more information about the Personal Histories project please visit the project’s website.